Advances in dental technology are improving the way we do just about everything, from keeping track of your records to treating complex issues. Using laser dentistry, your dentist can provide more comfortable and efficient hard and soft tissue procedures, like cavity detection, cold sore treatment, the biopsy of abnormalities in oral cancer screenings, and much more. Your laser dentist in Ripon is at Silver Creek Dentistry! Laser dentistry benefits everyone, but patients who are nervous visiting the dentist can especially benefit from laser dentistry, as it eliminates the need for scalpel and stitches in a number of dental procedures. 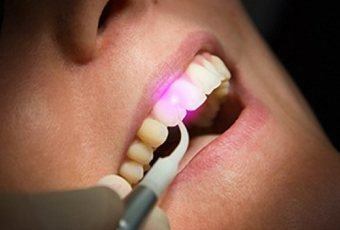 For its significant benefits, more dentists across the country are adding laser dentistry to their services each year. Gum disease is a chronic inflammatory disease that causes pockets of infection between the teeth and gums. Scaling and root planing is the gold standard nonsurgical treatment for gum disease, and with the help of our diode laser, we can perform the treatment even more effectively. After removing the plaque and tartar from the surface of the tooth with handheld tools, we use the diode laser to decontaminate the area, eliminate the diseased tissue, and finally kickstart the healing process. Laser assisted periodontal therapy is a noninvasive, pain free way to treat mild to moderate levels of gum disease. Crown lengthening: For short, stubby, or broken teeth that need treatment, crown lengthening creates more space for your dentist to work with. Gummy smile: If too much gum tissue covers up the white tooth enamel, we can improve the proportion of your smile by snipping away the excess tissue to reveal more of the teeth that are hiding behind it. Cold sore treatment: For persistent cold sores, the dental laser can reduce pain and minimize healing times. Biopsy: If biopsy of a suspicious area is recommended following an oral cancer screening, we can remove a portion of the area to speed up diagnosis and treatment. While your exact treatment plan depends on what you are having performed, it’s often possible to complete laser procedures without any anesthesia at all. The laser is a small, handheld tool that emits a small, super-concentrated beam that your dentist uses to treat or cut away your hard and soft tissue. Once the procedure is complete, there is no need for sutures or stitches, as the laser encourages blood clotting as it works. Recovery from a laser procedure is generally much faster than with traditional oral surgery. Make sure you attend all follow-up appointments with your dentist as scheduled. Visit Your High-Tech Dentist Today! When you visit a dentist who invests in the latest technology, like laser dentistry, you’re making sure you and your loved ones can benefit from the very best dental care currently available. In Ripon, your high-tech dentist is at Silver Creek Dentistry! We invite you to request an appointment for expert dental care today.